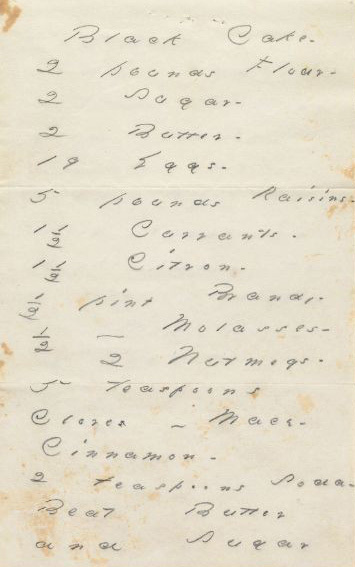 Dickinson’s manuscript recipe for black cake, from which these lines come, was sent along with a bouquet of flowers to Nellie Sweetser in the summer of 1883. 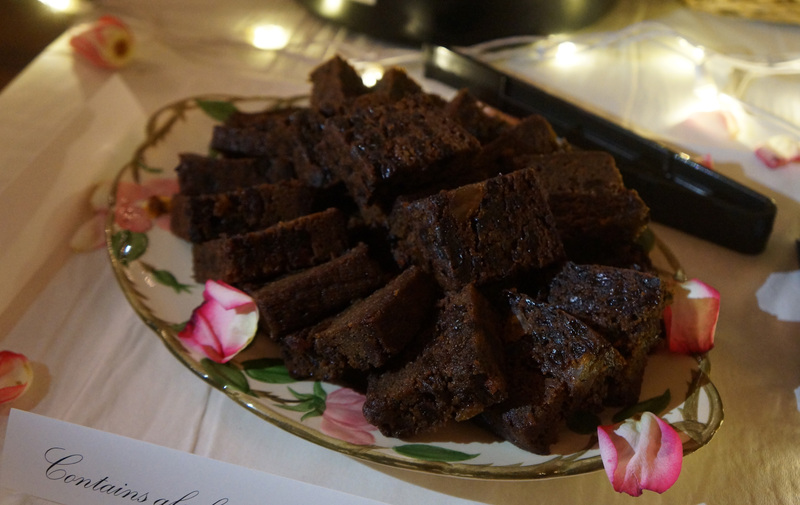 Black cake, a traditional Christmas specialty closely related to the English fruitcake, but “blackened” with the addition of burnt sugar syrup or molasses, was generously spiced with nutmeg, cinnamon, mace, and clove before being wrapped in brandy or rum-soaked cloth and often aged at least a month. The recipe Dickinson left, though somewhat shocking to a modern viewer (19 eggs! ), turns out to be remarkably orthodox in its ratios–if not its scale. Fully assembled, the recipe produces batter weighing in excess of 20 pounds. As to how we came to bake this cake, we remember the origin of the idea a little differently: According to Emilie H., a dedicated baker, Emily W. asked her almost upon their meeting five and a half years ago whether she had ever and if not, would ever, bake the Emily Dickinson black cake. Emily W., however, remembers patiently waiting a year to ask the question. Regardless of how the epic cake baking transpired though, we two Emilies have been discussing it for a long time. Finally, we set our plan in motion and one morning in early November we gathered, Emily and Emilie, to bake Emily’s cake. In the company of our colleague, Heather (who can’t help not having also been named Emily) and overseen by Mochi (a cat who can’t help it, period) we spent the day with the recipe, getting a notable arm workout, and thinking about Emily Dickinson. We are certainly not the first to undertake Emily’s black cake, but we took particular joy in the unique opportunity to work from a digital facsimile of the manuscript, following the poet’s distinctive hand through the loosely outlined receipt. The digitized manuscript is now online so that anyone possessing an adventurous baking spirit can also have this experience. The page is a pragmatic one, but somehow bears the poet’s touch: “2 Nutmegs. / 5 teaspoons / Cloves – Mace – / Cinnamon -“. Though not comprehensive, our survey of previous efforts to bake the black cake documented online, showed that many have scaled the recipe down or altered ingredients to make it more palatable to modern tastes. We wanted to stick to the original recipe to experience what Emily Dickinson may have experienced, taste what she may have tasted. In the end, the whole process generated more questions than it answered. But that was, in part, the idea. The archive does not always, or even often, offer up fully formed answers, but for the curious mind, it is never shy in offering questions for further investigation and consideration. What would we, could we, learn by sticking to the recipe as faithfully as we were able? What would we find out? For example, twenty pounds is a lot of cake. Why might the recipe have been so huge? Did Emily make it by herself? Did she ever try mixing all that batter? Did servants help her? And what, after baking, did she do with it all? We particularly agonized over the citron. What form did it take exactly? What sort of citrus fruits would have been available to Emily? Why didn’t she use candied orange peel, a common (and often considered tastier) ingredient in cakes like this? Probably wrongly we became hooked on the notion that we needed to start from scratch with the 1 1/2 [pounds] citron called for by Emily. 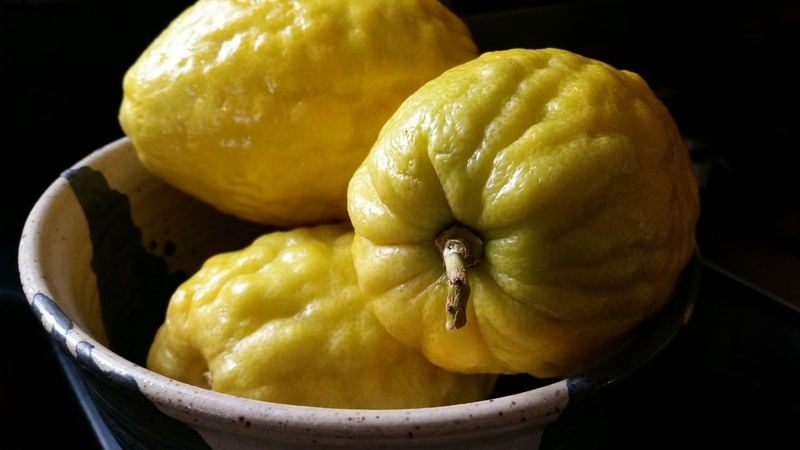 Striking out on finding fresh citron in some seemingly likely places, we then turned to the phone and rang around 30 plausible stores in the Greater Boston area, before finally locating a stash of fresh etrog citron in Charlestown. Treasures obtained, we then candied them. Did Emily Dickinson do the same? We doubt it. One, it seems fresh citron would have been even harder to find in nineteenth-century Amherst than in twenty-first Cambridge, more likely it was candied elsewhere and sold ready to use. Two, as it turns out, candying citron is actually a terrible lot of work, and not remarkably rewarding, particularly lost as it is in the cake’s abundance of raisins. Also, surprisingly, the recipe doesn’t call for salt. That is very strange to our modern sensibilities, but what about those of 150 years ago? Perhaps it was just assumed and thus didn’t need to be written down? Was the butter salted? And here we owe you a confession—after much hand-wringing and a minor, entirely good-natured, argument on the subject, we did add salt. It was our only broken rule, ingredient-wise, but we wanted people to enjoy the cake and salt seemed necessary. And too, encounters with archival materials do offer us these opportunities to interpret, to riff, to season. Of course, even in our attempt to be mostly faithful, it is impossible to think that any of our modern day ingredients are like their mid-nineteenth-century counterparts. What were the raisins like? (And why 5 pounds of them!?) The flour? The butter? Not to mention the milk pan the cake is meant to be baked in. We did research milk pans, antique shallow ceramic bowls, and thought about trying to obtain one, but being more than $100 into a potentially inedible cake already we opted instead to embody some nineteenth-century New England thrift and used an assortment of pans we already had on hand. 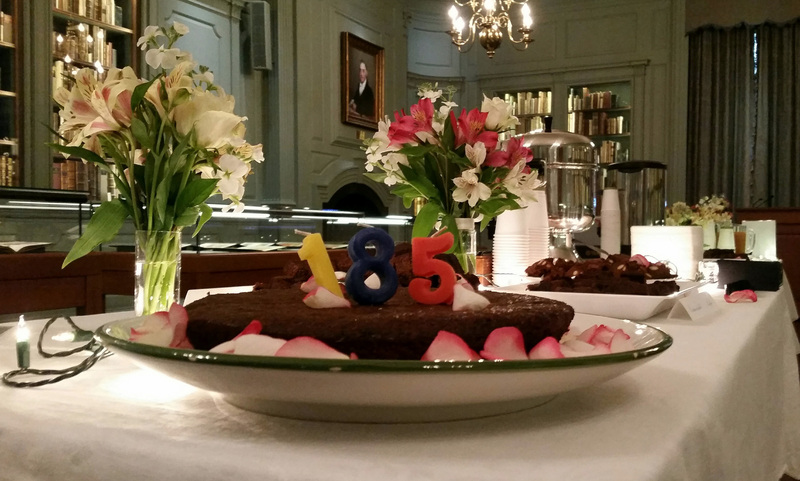 Today, one day after what would have been Emily Dickinson’s 185th birthday, we invited the Harvard library community to Houghton to share in the black cake–which turned out to be rather a hit with the crowd who left us only with crumbs and high spirits. Happy birthday, Emily! Today we have celebrated you joyously. 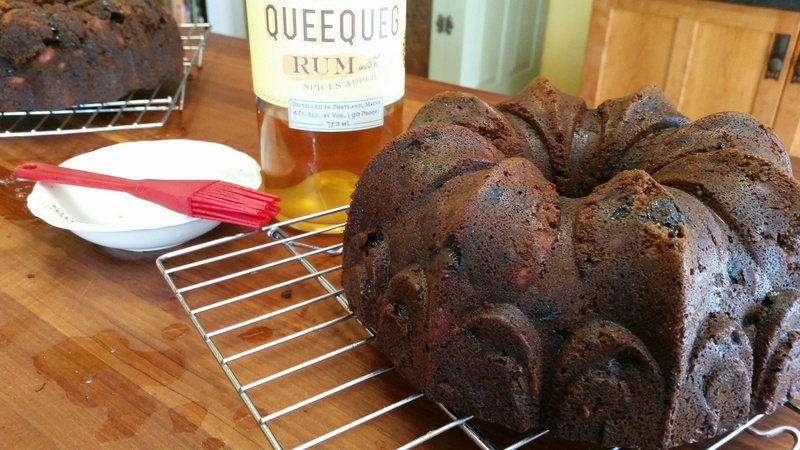 Melville must be gratified by the Queequeg rum, and the cake looks terrific (!). Emily Dickinson would have been so proud of you! Maybe even writing a poem to you about cakes and friendship. Большое спасибо за интересный материал и видео! Обязательно в этом году буду печь рождественский кекс по рецепту Эмили! Fantastic project. The video gives the cake personality and enormous depth. Thanks for showing the tasty side of library research. Thanks to Heather too, she might be an honorary Emily. What an absolutely delightful experience! It took a lot of courage to put that cake together and hand mix the whole batch–wow! Love the video! Looks yummy! Wonderful what can be done when three Emilies join forces! Waw…amazing! You’re awesome! I really liked it so much. Thanks for sharing. Would all that batter been baked as what the eighteenth century would have called “a great cake,” like the traditional cake for Twelfth Night? It would have been in the oven past dinner time! Thanks for all the elbow grease! Well done!!! Having made this recipe to the full in a turkey pan, 40 years ago, I’m well aware of all the work, thought and joy you all put into it. Profound applause to all. I think, though, that sometimes we all think too much and talk too much more, when one realizes the simple fact that, in the Amherst of the 1850’s, grocery stores were not around the corner, that even rye was grown on the Dickinson’s small farm, cooks had to fiddle with what was available and food storage was prime for winter survival. Registering all that, one has to conclude that we moderns might all be just a little too fussy in our search for perfection…. Nevertheless, you all did a wonderful job and you did it wonderfully. Thank you so much for the video.